The organizational Structure: The Higher Consultant Office, Executive Office, Central Council, in addition to several internal committees. 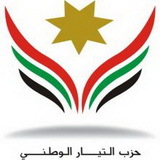 Party’s Objectives: - Enhancing the values of national unity, political loyalty, equality, moderation and tolerance. Emphasizing the rules of good governance which is based on expanding the popular participation and building the rule of law, political reform and political development through the development of governance mechanisms as well as conciliation between the concept of security and its policies and procedures on one hand and the principle of respecting the freedoms and protection of citizenship by law on the other hand. Emphasizing on the national unity.